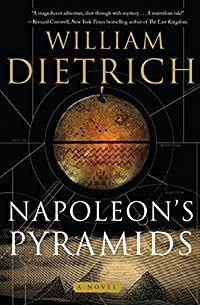 Napoleon's Pyramids by William Dietrich, a Mysterious Review. Review: William Dietrich has blended the characters of the Indiana Jones and Rick O'Connell (of the "Mummy" movies) into the energetic and resourceful Ethan Gage, an American living in late 18th century France, and inserted him into a magnificent adventure, Napoleon's Pyramids. Ethan is probably best described as an intellectual neer-do-well, someone undoubtedly capable of greater things but willing to whatever is needed just to get by. An associate of Ben Franklin, he parlays his knowledge of the new science of electricity into a trip to Egypt as one of many savants in the company of France's new emperor, Napoleon Bonaparte. Unable to invade England, Napoleon creates a new mission to expand the empire of France: the "liberation" (read conquest) of Egypt. An incidental objective, and the reason for his entourage of scientists and engineers, is to solve the mythical secrets of the Great Pyramid. An ancient Egyptian medallion, which Ethan won in a card game in Paris, may hold the key to unlocking the mysteries of the Pharaohs. It's tempting to think of Napoleon's Pyramids as simply being a literary version of Raiders of the Lost Ark or The Mummy, but it is much more reminiscent of the imaginative tales of Jules Verne. As with Verne's novels, there's something about Ethan's journey that is so fantastic and so incredible that the reader is able to readily dismiss notions of the utter implausibility of some of the action and simply share in the adventure as presented. It certainly helps that Dietrich has effortlessly incorporated real historical events, mathematical conundrums, and the general wonder of the pyramids and the region into his story. While Napoleon's Pyramids is not the perfect historical adventure story—a plethora of details often interrupt the otherwise non-stop action—it is certainly a thrill ride worth experiencing. It should be noted that the rather abrupt ending to the book is somewhat intentional: the author has already announced that a sequel is in development based on Napoleon's invasion of the Holy Land. Acknowledgment: Book Report Network provided a copy of Napoleon's Pyramids for this review.